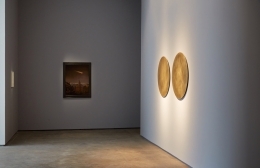 Sean Kelly announces Soleil Double, an exhibition of new work by Laurent Grasso. 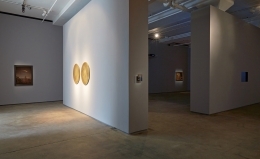 This will be the artist’s first solo show in New York since his critically acclaimed SoundFossil of 2010 and his first solo exhibition in the gallery’s new space. An opening reception will take place on Friday, September 12 from 6:00 to 8:00 p.m. The artist will be present. The exhibition will be an ambitious installation in which Grasso transforms the gallery into an immersive environment, a multimedia labyrinth that includes new sculpture, paintings, photographs, neon works and video (the eponymously titled film will make its US debut in this exhibition). Grasso filmed Soleil Double in EUR, a city district of Rome originally developed in the 1930s. EUR was to be an important complex of the 1942 Worlds Fair and was to act as an homage to the 20th anniversary of Fascism. However, the Worlds Fair never took place due to World War II. 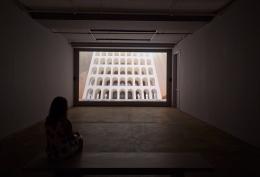 Eventually, in the ensuing decades, some of the buildings were completed in their original design while others were added in a more contemporary style – creating an architectural environment that appears to exist in multiple simultaneous timeframes. 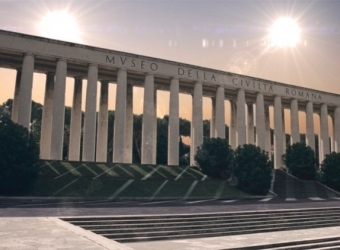 The two suns shining over the plaza in the film suggest that some sort of natural disaster or phenomena is occurring – a phenomena that is also referenced in the paintings with double suns included in the exhibition. The themes addressed in Soleil Double are not just about the proposed phenomena of two suns in axis around the earth but on a more symbolic level, about the concepts of duplicity and ubiquity, the idea that reality could be something other than what it appears to be at first glance, than what we take for granted as “true” and “right”. These shifting perceptions of reality and the investigation of the territory between what is known and unknown are subjects common throughout Grasso’s oeuvre. 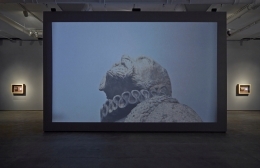 In addition to Soleil Double, which will be shown in the lower level gallery, a focal point of the installation in the main gallery will be a large-scale projection of Grasso’s film, Uraniborg, which examines the scientist Tycho Brahe’s discoveries in astronomy in the 16th century and, specifically, the astronomical observatory that Brahe built in 1576 on the island of Ven in Sweden. The development of astronomical science at this time signified a capacity to understand and represent the universe. 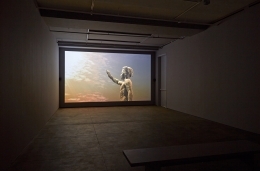 For Grasso, the focus in the film, as in much of his work, is about how the study of astronomy was linked to the idea of power in the 16th and 17th centuries. 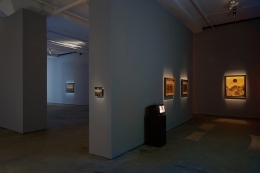 This narrative is further explored through the paintings and photographs included in the exhibition, such as the silver bromide prints from Grasso’s Specola Vaticana series. 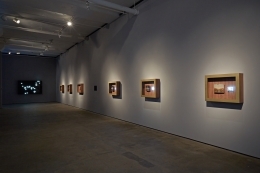 These works depict historical photographs of the pope looking through a telescope – an instrument that symbolizes observation and knowledge and, through them, control – installed in the Vatican observatory, originally established by the Holy See in the late 1700s. Grasso will present the Sean Kelly exhibition with a simultaneous iteration of the Soleil Double exhibition at Galerie Perrotin, Paris, from September 6 to October 31, 2014. 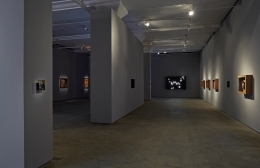 Grasso was awarded the Prix Marcel Duchamp in 2008 and is the subject of a major monograph – Laurent Grasso: The Black-Body Radiation – published by les presses du réel. 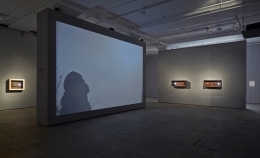 Recent solo exhibitions have included Laurent Grasso: Disasters and Miracles, at the Kunsthaus Baselland, Basel Switzerland (2013); Uraniborg at the Musée d’Art Contemporain, Montréal, Canada (2013) which traveled from the Musée du Jeu de Paume, Paris, France (2012); Laurent Grasso: Portrait of a Young Man, at the Bass Museum, Miami (2011) and Laurent Grasso at the Hirshhorn Museum and Sculpture Garden, Washington, DC (2011). 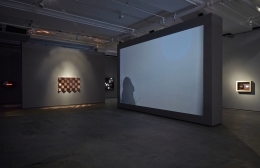 Grasso is currently included in the group exhibition, Curiosity: Art & The Pleasures of Knowing, on view at the de Appel Arts Center in Amsterdam, through September 14, 2014. 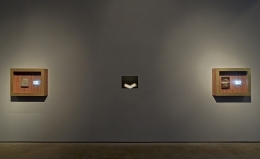 Grasso’s US public art debut, Infinite Light, was installed on the exterior of the Hunter College Lexington Avenue pedestrian walkway in New York in 2008. His acclaimed Nomiya project was installed on the roof of the Palais de Tokyo, Paris, from 2009 through 2011. He has participated in several biennials, most recently: the Gwangju Biennial, Gwangju, South Korea (2012); Manifesta 8, Carthagène-Murcie, Spain and Manif d'art 5, Québec City Biennial, Quebec, Canada (2010); the Moscow Bienniale, Moscow, Russia (2009); and the 9th Sharjah Biennale, Sharjah, United Arab Emirates (2009).